I do not have the most spectacular luck growing edibles in my garden. First, it's teeny tiny. Second, it doesn't get enough direct sun for veggies. And third, the damn squirrels! My city is full of parks, community veggie gardens and restaurants. Locations where a squirrel could get a good meal and sleep like a furry king. But instead, they live in my yard and feast on my few veggies. For the record, squirrels LOVE Japanese white eggplant. Well, it appears they love all eggplant, but the long, thin white ones are their favorite. This summer I've only eaten two. The squirrel(s)? Close to a dozen. Argh! They also love my big red ripe tomatoes. Oooooh you do not mess with my t'maters! I wait 11 months of the year to eat real tomatoes. You know, that actually taste and smell like a tomato. So I've taken to picking them early and letting them ripen on a sunny window. Which is fine. But annoying. I shouldn't have to be in a veggie war with a furry rat. All this to say that I was surprised when I went to do a pick before Irene rolled through town, to find this giant beast of a purple eggplant growing. Actually, I was a little worried that it was too large to be flavorful. But I took a chance and turned it into a mock pizza crust. Teaspoon in photo so give you scale. That purple beauty is HUGE! Well, success if you don't rely on this as your pizza fix. Because even though I keep calling it pizza, it's really not even close in flavor. I just think it sort of looks pizza-ish. Regardless, it was mighty tasty and easy to prepare. * Spritz grill pan with EVOO spray and heat it up. Grill slices of eggplant (or squash) on both sides just to add a little flavor. Don't cook all the way through. * After both sides are grilled, move slices to a cookie sheet that has been spritzed to prevent sticking. * Add 1-2 tablespoons of your tomato sauce (I used salsa but any leftover pasta or pizza sauce would work great too) to top of eggplant. * Add @1 tablespoon shredded cheese. Add tomato slices (I used 1 1/2 slices per eggplant slice to cover because the eggplant was humongo). Top with another tablespoon of cheese. 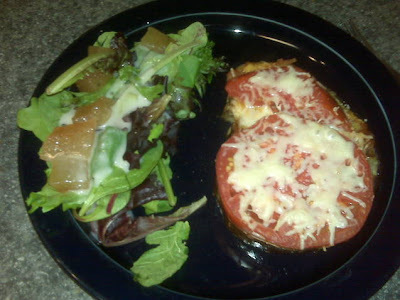 * Bake until cheese is melty and veggies are heated through. @10 mins should be fine. You could certainly add other toppings such as meats, grilled onions or extra seasonings. But I found the salsa and cheese to add plenty of flavor and salt that I really didn't need to add more. It may not taste like a pizza, but it looks delicious! I love eggplant! The rabbits in my yard kept stealing mine. 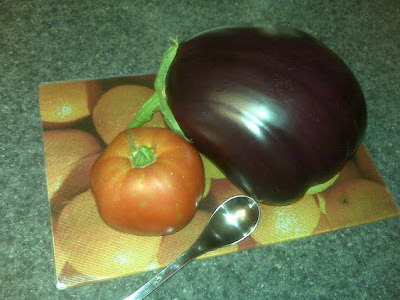 Wow, that eggplant is ginormous!! I'm so jealous. I have yet to harvest an eggplant this year. The critters keep snatching them all! I'm not a huge eggplant fan, but this recipe looks really good. I may have to try it. I used to think I disliked eggplant too. But it turns out its the texture and sometimes the skin, which can be bitter. Try peeling the skin and just make sure you don't bake it until mushy. Make sure it's still firm enough to bite- makes all the difference. 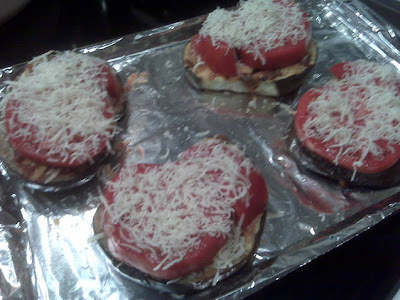 I've made eggplant "burgers" but never thought about pizza - I love this idea!